More than 40 years ago, Taylor and Wherry (1951) hypothesized that performance appraisal ratings obtained for administrative purposes, such as pay raises or promotions, would be more lenient than ratings obtained for research, feedback, or employee development purposes. However, research on appraisal purpose has yielded inconsistent results, with roughly half of such studies supporting this hypothesis and the other half refuting it. To account for those differences, a meta-analysis of performance appraisal purpose research was conducted with 22 studies and a total sample size of 57,775. 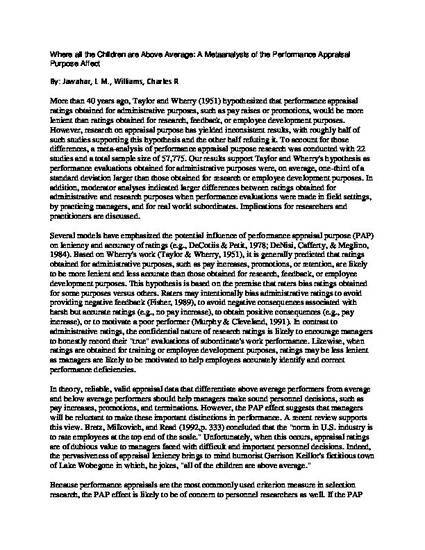 Our results support Taylor and Wherry's hypothesis as performance evaluations obtained for administrative purposes were, on average, one-third of a standard deviation larger than those obtained for research or employee development purposes. In addition, moderator analysis indicated larger differences between ratings obtained for administrative and research purposes when performance evaluations were made in field settings, by practicing managers, and for real world subordinates. Implications for researchers and practitioners are discussed. JAWAHAR, I. M., & WILLIAMS, C.R. (December 01, 1997). WHERE ALL THE CHILDREN ARE ABOVE AVERAGE: THE PERFORMANCE APPRAISAL PURPOSE EFFECT. Personnel Psychology, 50, 4, 905-925.
which has been published in final form at: http://dx.doi.org/10.1111/j.1744-6570.1997.tb01487.x. This article may be used for non-commercial purposes in accordance With Wiley Terms and Conditions for self-archiving'.